Put a lock on your personal data with Kingston's DataTraveler Locker+ G3. It secures receipts, bank statements and other sensitive documents with hardware encryption and password protection for a double layer of data security. 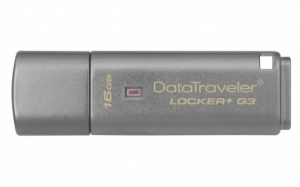 The drive locks down and reformats after 10 failed login attempts, so users can rest assured that their data is safe even if the drive is lost or stolen.